Superman is the third figure in the Batman v Superman collection from Mezco Toyz. He’s still solid, but not quite to the level of other One:12 figures. So, here’s the thing, I think you should know that I hold the One:12 Collective to a pretty high standard. It’s a phenomenal line, no doubt, and might actually be my favorite action figure line right now. It’s like if Mego was actually good, instead of just neat for offering a bunch of heroes and having nostalgic cool. Actually, make that “it’s like if Mego was awesome”. Cause really, One:12 is all of that. Not that I mean to say that I’m always in love with it. I dug the Captain Marvel Shazam figure a ton, but wasn’t crazy about the fit on the figure’s outfit. It wasn’t great at all, as the Captain had a case of the saggy britches. That’s not something that I’m used to seeing from the One:12. Mezco has done a tremendous job with this series of figures, and so I hold all of them that see release to a very high standard, as I mentioned. So where does Superman here fall onto my scale? Well, let’s see how it plays out. If you’re a One:12 fan, then you know what the sculpting and articulation is like on the Man of Steel here. The One:12 series has a tremendous amount of posing options, and that’s a trend that continues here. 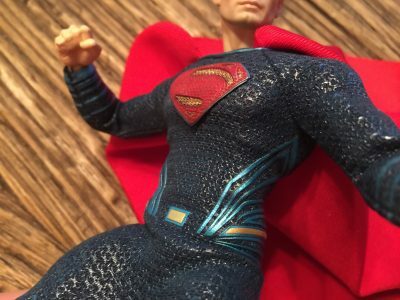 Unlike a lot of action figures out there, a full range of motion is possible with Superman here, as he’s stocked with 32 points of articulation. As a part two to that, the sculpt here is a mostly good thing. 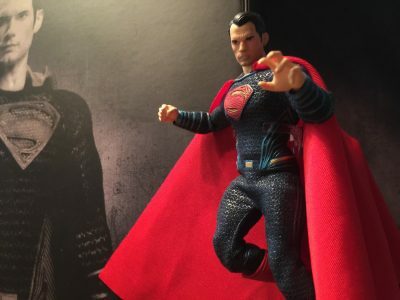 This figure is based on actor Henry Cavill’s portrayal of the Man of Steel in last year’s Batman v Superman feature film. So, with that, the question becomes if it actually looks like Cavill. The answer is yes, it does. 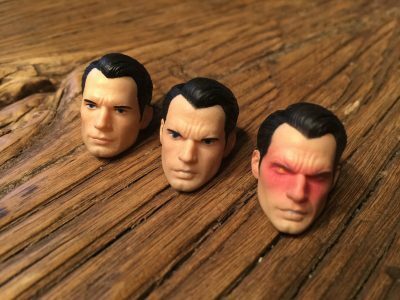 All three of the head sculpts included in the box are a solid likeness of the actor. They’re not exact, it seems like something’s a little off, but they’re close enough to certainly look like him, even if you linger on each portrait. Speaking of, the faces included are actually pretty cool. There’s a standard, relaxed face, an angry face, and a very similar angry face with heat-vision effects. The heat vision face isn’t as interesting as I would have liked (some red-hued smoke effects would have been nice coming off of the eyes), but it’s serviceable and comes across well enough. And the other two are just fine, so it’s not a bad selection at all. The biggest issue I had though, is that the figure doesn’t seem bulky enough. I know that, drawn by most artists, Superman isn’t as big as the Hulk (for example), but he’s far from scrawny. Likewise, Cavill is a big guy in the films. This Superman however, well he’s just not all that impressive, physique-wise. That seems to be a trend with the character when it comes to mixed-media figures though. I’ve seen the same thing with Sideshow Toys’ 12″ comic book Supes. He’s too thin, and that’s the same issue here, though to a lesser extend than that figure. 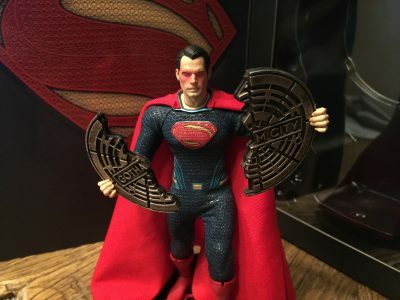 What worries me, is that I see the same thing with the forthcoming comic-influenced Superman from Mezco. And it’s something that I hope is seen to before release. Getting back to BvS Superman though, he’s not terrible. I just would have liked to have seen a little more effort put into a new body type for him. Another issue I had with this figure though, is the House of El uniform. Usually, this is far from a problem with One:12 figures, but not so here. As I mentioned, it’s by and large the same complaint I had with Shazam. Though the styling is great, and the cape is fantastic, Superman’s outfit is just kind of… ill-fitting. Again, like with Shazam, it’s not completely terrible, and you can get him looking pretty great on the old shelf, but the fit on the legs and crotch isn’t great. It’s saggy and just kind of looks like maybe bought a pair of pants one size too big. Or maybe got them at Target. You know, they fit great at the waist, but the legs are way too big. Who hasn’t been there? In any event, they just don’t look great. And that’s knocking the overall look of this figure down a few pegs in my book. Extra hands? Extra heads? That’s all good stuff. A stand that doubles as a flight stand with those awesome “cape clip” things for added dramatics? That’s awesome. The problem with all that, is that it’s all really standard stuff with One:12 figures. What does Superman come with that’s new and personalized? A manhole cover. I mean, it breaks in half so you can make some neat poses with it, but it’s… a manhole cover. No kryptonite, no dusty Bat-cowl (from the Knightmare), no snap-on exploding K-grenades from the big BvS fight… nothing like that. If you don’t collect this line, I realize that that previous section probably looks like a lot of warrantless complaining. 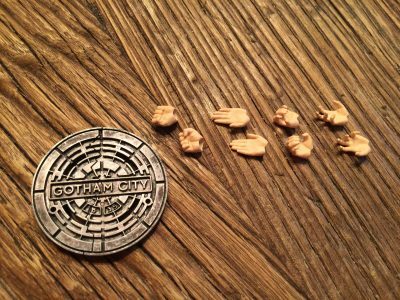 But consider that figures like The Punisher, Daredevil, and BOTH Batmen from the BvS film are bristling with extras. All of them are unique to those characters and (almost) all of them are amazingly cool. 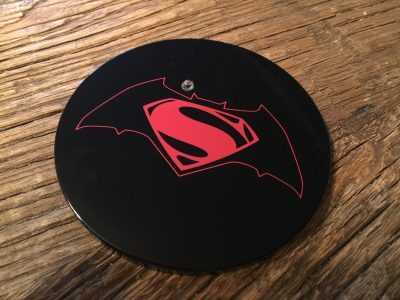 Superman though, comes with a manhole cover. So, yeah. I know there was a lot of complaint here overall, but “movie” Superman here isn’t a bad figure. He suffers from not being as great as almost all of the rest of figure in the line is all. That’s tough to say since I was really looking forward to this one, but in my opinion, it’s true. Still, if you’re dying for a Superman in your collection, he’s not terrible. As you can see, you can get him in some pretty awesome poses, and he looks very nice indeed on my shelf. He’s been out for a while at this point though, and unlike the rest of the One:12, he’s completely gone off of the Mezco Toyz online store. So I wouldn’t expect him to come back into stock there. Nope, it’ll be the secondary market for you should you want to add the Man of Steel to your collection. 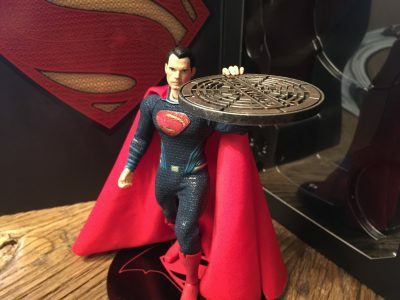 The One:12 Collective Superman figure from BvS is still a pretty nice action figure of the Man of Steel. The sculpt is solid, the articulation is excellent, and the standard extra heads/hands are great. But he doesn't include any interesting accessories (that manhole cover...) and his suit is somewhat ill-fitting. Somehow though, he still manages to look cool on the shelf, which is a testament to Mezco's incredible One:12 line itself. Previous NYCC 2017: Valiant announces exclusive Bloodshot… teddy bear?